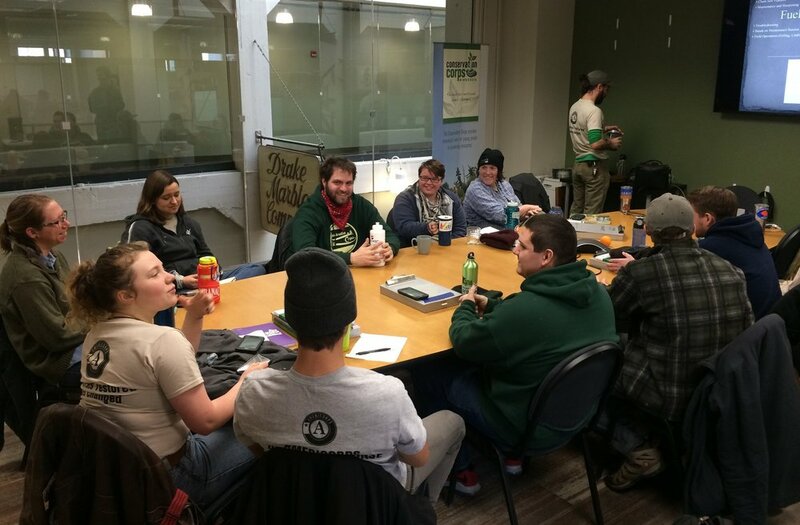 Crew leaders from Central District settle in for a presentation on chainsaw operation at the Conservation Corps headquarters in Saint Paul, MN. The answer to this question is critical at the Conservation Corps, where field crews are trusted to work safely and effectively in far flung posts across Minnesota and Iowa. Applicants willing and selected to lead these crews are responsible for their crew members’ safety and work performance at project sites. They solve technical hurdles in the field, look after their crew members’ development, and also address any interpersonal challenges that may come up among members. So how does the Conservation Corps prepare new crew leaders to fill these shoes? The straightforward answer: Gather new crew leads from around the state together at an overnight base camp for a week of orientation that includes an introduction to National Service, workshops on conflict mediation and risk management, scenario-based problem solving, Q&A sessions with seasoned leaders past, personal values assessments, and a two-day finale of Wilderness First Aid training. Then send these leaders-in-the-making back to their service districts and follow up with a second week of technical skills training on chainsaw operation, pesticide application, GIS tools and mapping, truck and trailer operation, expense reporting, and effective social media practice. The complicated truth: Authentic leadership skills take shape over time, on the ground and in the heat of critical moments that require decisive action. Crew leader orientation and training help give new leaders the tools to develop these skills, but that development itself comes later through an evolution unique to each individual. 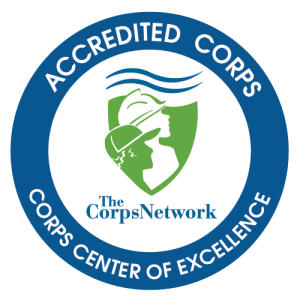 Still, those first two weeks of training are an essential, if brief, phase of learning and a critical initiation to the service crew leaders will be performing with the Conservation Corps. Corps staff spend an immense amount of time preparing to welcome new leaders each year, and the experience they create for these recruits is the result of honing and hewing that has taken place over many iterations. There are perhaps four main pieces of crew leader orientation and training that help prepare budding leaders to bloom: the setting, the soft skills, the self-analysis, and the technical skills. Content aside, the context of crew leader orientation sends an important message in itself and allows AmeriCorps members to gain valuable perspective on the program. And maybe even more importantly, by gathering all together, crew leaders get a sense of the scale of the program. “It helps create context for what people are doing,” Dorian pointed out. “When crews are in their own settings, it’s easy to lose sight of what their connection is to the state’s natural resources and where they fit into the picture. Bringing everyone together helps them see what all the different crews all over the state are doing and what we’re accomplishing as a broader movement. Finally, the extended stay at the camp-like setting ensures that members have ample time for informal getting-to-know-each other. The folded hands and quiet apprehension of the first day quickly give way to a more open atmosphere as crew leaders chat over meals, relax together during evenings, and settle into the excitement that comes from meeting so many like-minded people. Having the chance to share stories and build camaraderie at orientation is what makes each year’s cohort a real leadership team rather than just a sea of solo ships. Crew leaders persevere through a tense game of Jenga during Crew Leader Orientation at Camp Friendship in Annandale, MN. Before crew leaders get their hands on chainsaws and power tools during week two, orientation introduces them to the skills that will make them not just technically competent instructors, but engaged and proactive mentors and team builders. The first couple days of orientation are heavy in presentations and discussions that cover topics like motivating crew members, communicating expectations, and building an effective crew dynamic. Small group break-out sessions give the new leaders a chance to work through various scenarios that could come to pass during their term, and they also get to talk candidly with field leaders from years past about some common experiences and challenges. The communication and problem-solving skills that crew leaders start building during these small group sessions are maybe one of the most important parts of orientation. And hence the importance of leaders getting to know themselves. To take more direct aim at this goal, Central District staff rolled out some new agenda items within their cohort this year focused on self-analysis and personal values assessment. 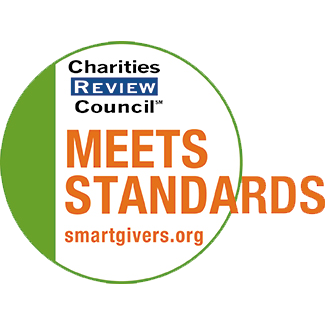 “We’re trying to get them to assess and better understand their own values as individuals and then better predict how they would act when they’re alone,” Matt explained. “We also want them to understand how scenarios might play out when their crew members have values that clash with theirs – for example if a leader values punctuality and a member doesn’t.” The new activities include looking at crew leader case-studies from past years, and even case studies on CEO leadership styles in other professional fields. Finally, after dealing in the abstract, freshly oriented crew leads start to get their hands dirty – and also dive into the world of logistics and administrative work. The second half of orientation week at the retreat center is devoted to Wilderness First Aid training. Then leaders return home to their service districts for a week of skills training with their district managers. Every district’s work is a little different, but some core skills apply to all. Leaders learn how to fill out the various paperwork that trails every field crew: expense reports, time cards, surveys of accomplished work. They also get briefed on social media best practices, as they’ll spend the next year (intentionally or not) acting as a representative of the Conservation Corps and the broader AmeriCorps movement. Crew leaders from Central District start hands-on chainsaw training in Saint Paul, MN. Crew leaders also get trained in on the GIS and mapping tools they’ll use to track their crew’s work at project sites, keeping First Aid kits up to regulation, truck and trailer operation, tool maintenance, and herbicide application. Toward the end of the week, leaders take a pesticide applicator test to attain a non-commercial applicator license. Indeed, if crew leader orientation and training sounds like a whirlwind, even for the programmable robots among us, that’s because it is. Unsurprisingly, crew leaders often comment that it’s hard to retain everything they are exposed to during those first couple weeks. February 25, 2019 by Conservation Corps. 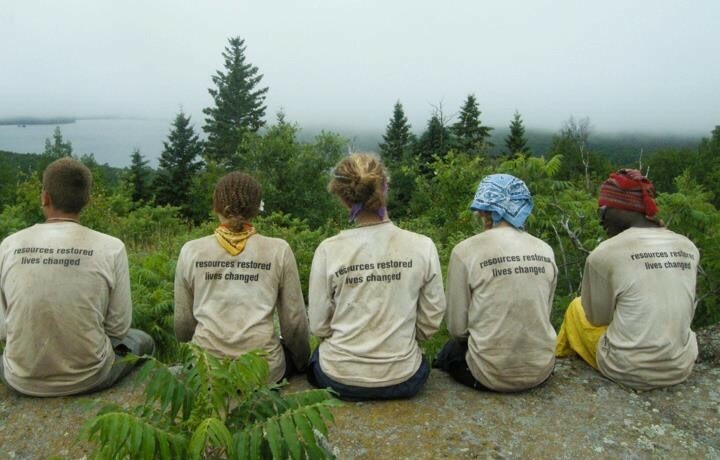 Margaret’s 2013 Wilderness Crew on Mott Island off the coast of Isle Royale National Park. Margaret Krueger’s time with the Conservation Corps has taken her on adventures to places that natural resource professionals might dream of – from remote lakes and islands within Isle Royale National Park, to far reaches of the Lake Superior Hiking Trail, to a National Wildlife Refuge home to the largest breeding colony of American White pelicans on the continent. And that was all while she was still in high school. Margaret’s story, from age 16 to 24, exemplifies the arc of personal and professional development that serving with the Conservation Corps can provide. And throughout this story, she has modeled the open-mindedness, flexibility and adventurousness needed to seize these opportunities for expansion and fully reap the rewards. Margaret first joined the Corps at age 16, after watching her older sister participate in Summer Youth Corps (SYC), a program that takes youth ages 15 to 18 camping around the Midwest to complete hands-on conservation projects. “As a little sister I watched her go through the program and really got interested. She returned to it for three years in a row and I got to see her gain networking skills and make lifelong friends.” Following in her sister’s footsteps, Margaret also completed three terms of SYC taking her through the end of high school. Each of her terms with SYC was a different experience, but the value and pay-off of adaptability was a common theme throughout. During her first term as a youth crew member in 2012, wind storm damage from the previous year left SYC participants at a back-up base camp and changed the operation of the program so that crews were sent on service trips longer and more far-flung than usual. Margaret’s crew ended up on a two-week trip in the Chase Lake area of North Dakota. The first part of the trip was spent on a prairie restoration project, while the latter part had the crew banding American White pelicans at the Chase Lake National Wildlife Refuge. 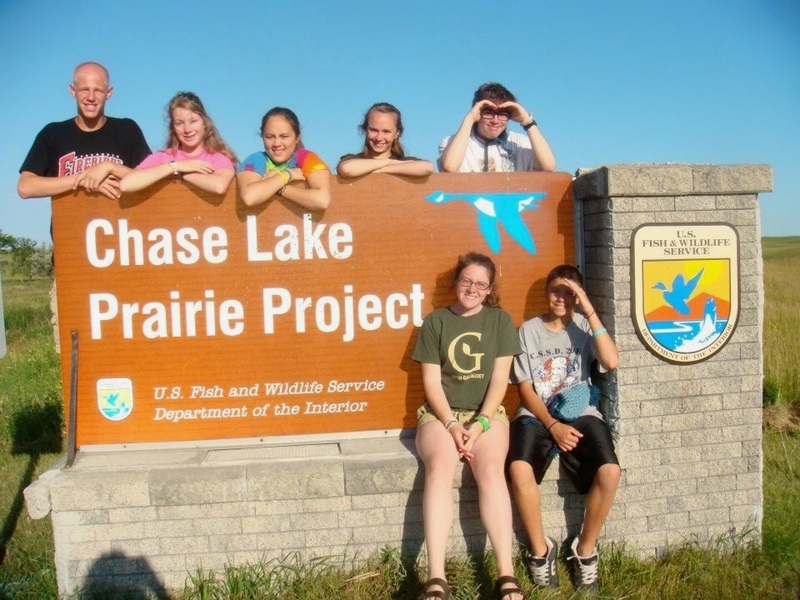 Margaret with her Summer Youth Corps crew at the entrance to the Chase Lake Prairie Project in 2012. For her second term with the Summer Youth Corps, Margaret took advantage of her previous experience to join the Wilderness Crew, which is an option specifically for returning youth members. The Wilderness Crew brought her to Isle Royale National Park in Lake Superior to work with the National Park Service on maintenance of the Greenstone Ridge Trail. “That summer was structured so that we had 10-day increments of work and then four or five days off. The National Park Service schedules their work that way because it can take so long to get to work sites there; sometimes you have to bushwack and portage in.” Still, the atypical schedule came with its perks. During their long periods off the crew got to go on extended hikes around the park and enjoy their time relaxing in the company of National Park Service staff. And of course, all that time spent working and wandering the remote island resulted in some enviable wildlife encounters! “There were several times when were just hiking or working and would see a moose and her babies or something else incredible.” Margaret and her crew even got to meet the researchers studying the island’s wolf and moose populations. Margaret’s 2013 Wilderness Crew near the Greenstone Ridge Trail on Isle Royale National Park. Finally, during her third term with SYC, Margaret ventured into a somewhat different role and served as a “swamper.” “A swamper is essentially a gopher, so that position requires an incredibly flexible person. American Sign Language is a significant part of SYC and the sign for swamper is essentially ‘doer person,’ and that’s exactly right.” As a swamper Margaret spent much of her time either filling in for Crew Leaders or back at the base camp running the kitchen and managing other logistics. Acting as a Crew Leader, she got to lead trail maintenance work along the north shore of Lake Superior, at Tettegouche and Gooseberry Falls state parks, as well as on the Superior Hiking Trail, a portion of the term that she remembers very fondly. In addition to those general networking skills, Margaret’s work with SYC is helping her out in more specific and specialized ways as she starts to build curricula for the DNR’s I Can Camp! and I Can Paddle! programs. These summer offerings introduce Minnesota families to various outdoor recreation activities while also educating them about local ecology and natural resources. 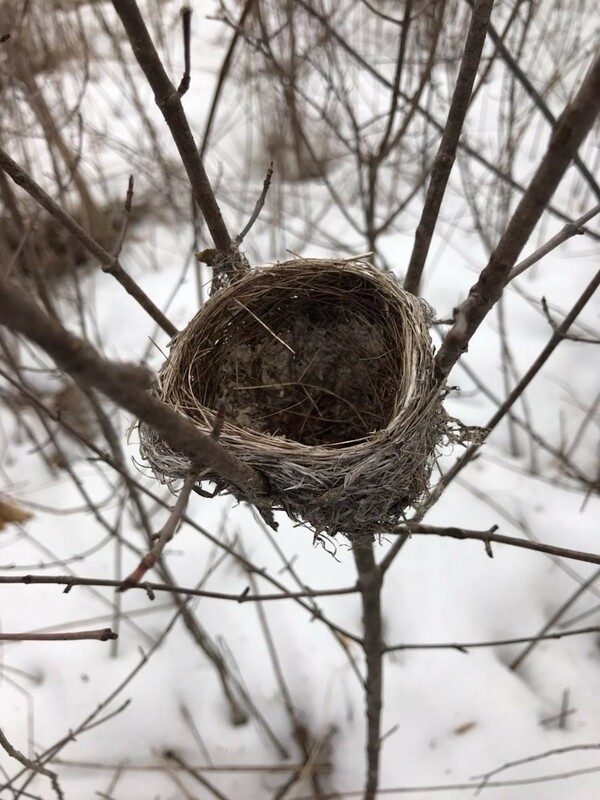 To get launched on this ambitious project, Margaret will be connecting with Corps staff to access some of the environmental education resources she used as an SYC member and essentially facilitating a collaboration between the Corps and the DNR. Her advice to people who might still be contemplating service with the Conservation Corps? 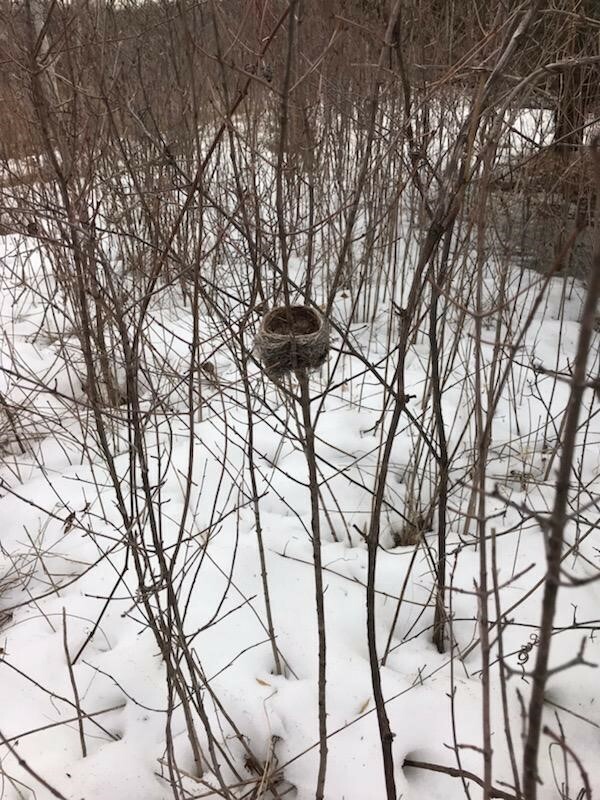 February 14, 2019 by Conservation Corps.